Green Man provide all aspects of commercial carpet cleaning and deliver a range of treatments to restore high-traffic areas of carpeting to as close their original brightness as possible. Prior to all commercial work, we will conduct a full survey to enable us to plan a method of clean specifically to meet your needs. If you need your office freshening up prior to an important visit or inspection, we can help. Our modern, low-moisture system will remove most stains, deodorise & brighten your carpets, leaving them dry in less than an hour with improved stain resistance as standard. Where carpets are more heavily soiled or stained, we will use our powerful, deep-cleaning hot water extraction system for those jobs where a restoration clean is required. This method will sanitise the whole area whilst still being entirely environmentally friendly. Green Man regularly retrain and invest in sourcing the most effective, modern and environmentally responsible products to ensure we are delivering best practice to our commercial (and domestic!) customers. Green Man offer long-term carpet maintenance contracts, as well as one-off emergency cleans, and have been providing commercial carpet cleaning for over five years. 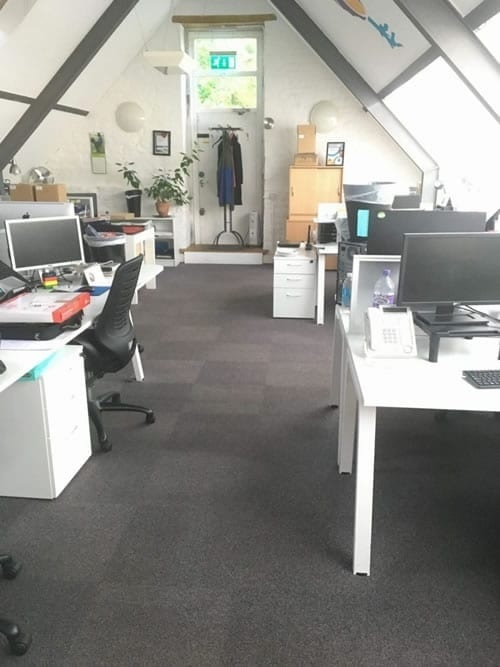 Recent office carpet cleaning in Bristol has included work at Temple Quay, Broadmead, Clifton & Southville. We are experienced in office deep-cleans, as well as low moisture, freshen-up cleans that necessitate fast drying and minimal down-time for your business. 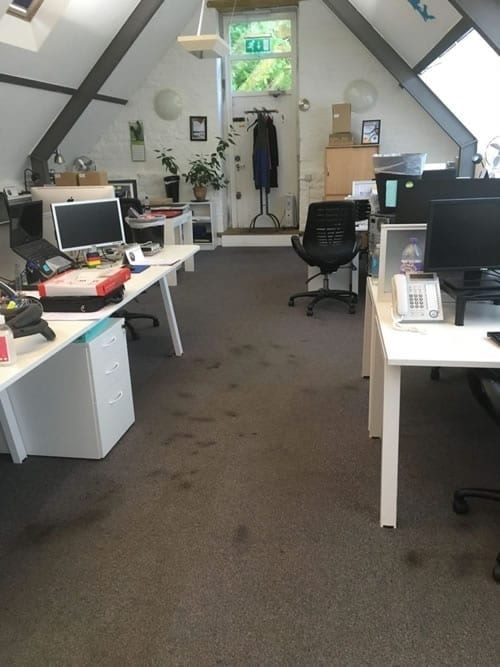 In Bath, we regularly clean serviced offices, pubs, cocktail bars, restaurants, as well as newly established tech start-ups that require static-free carpet cleaning to protect valuable servers & electrical equipment. Our operatives are comprehensively trained, insured and qualified in the most modern, effective and environmentally sustainable carpet restoration procedures. Green Man are committed to bring your carpeting back to a condition that reflects your commitment to high standards.